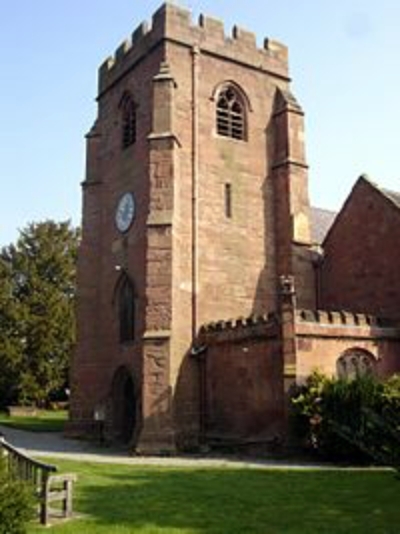 St. Mary’s Church Tower, Overton-on-Dee. I cannot find a Commonwealth War Graves Commission entry on their database for Alfred, I believe that he died, probably at home, I have found his burial in St. Mary’s Churchyard Overton, but I have also written to the Commonwealth War Graves Commission to see if they can find him on their database and if not can he be remembered, as there is evidence that he died through his war service and it was before the 31st August 1921, the cut off time for the CWGC. From that it seems that Alfred had married, but I could not find his wife’s name on the papers, and had 4 children, Alfred, born 28th August 1906, John Edgar, born 28th December 1907, Winifred, born 9th February 1910 and George born 19th December 1911. I have found Alfred and his family on the 1911 census living at 2, Wood Street, Crewe, Cheshire. Alfred Roberts is head of the household and a Railway Goods Porter, born in Overton, his wife of 5 years was Catherine, 24, who tells us that 3 children had been born to them and as can be seen in his story later Catherine was possibly pregnant with their 4th child George, who was born later in the year. Catherine had been born in Minera, Denbighshire. All the children, Alfred, 4, John Edgar, 3 and Winifred, 1, had been born in Crewe. A brother-in-law, Edward Roberts, 25, single, was living there and according to his place of birth of Minera, Denbighshire I believe that he was Catherine’s brother. I found a probable marriage at All Saint’s Church, Gresford, (Wrexham County Borough (Wrexham) C11/02/94) in 1905 between an Alfred Roberts and a Catherine Roberts. The description of Alfred on Discharge was that he was 36 years of age, born circa 1882, his address was given as 2, Wood Street, Crewe. He was 5 feet 6 and ¾ inches tall, his chest measurements were 37 inches with a range of expansion of 4 inches. His eyes were blue and he had dark brown hair. He had a scar on the back of his left hand. His Military Character was – Very Good. He was being discharged under “Para 392 (xvi) K.R. His occupation was a labourer, but later on other documents he was described as a Goods Porter. His disability was aggravated by ordinary Military Service. He enlisted on the 1st September 1914 shortly after war was declared and was home from that date till 26th September 1915 – 1 year 26 days, then to France from the 27th September 1915 to 2nd June 1916 – 249 days, then homes from 3rd June 1916 until his discharge on the 24th November 1917 – 1 year 175 days. His service was 3 years 85 days. His confirmation of discharge was at Nottingham on the 3rd November 1917. He was before the Medical Board at Worcester. It appears from his Casualty Form that Alfred was suffering for quite a few years previous to him being diagnosed with T.B. Early on he was complaining of Myalgia numerous times, in and out of the Field Hospital from 1915 – 1916 and it seems that from then he contracted T.B. His statement to the Medical Board was written through a third person I think :- “He states that he was admitted to Napsbury Hospital in July 1916 for Bronchitis remaining an inpatient for 2 months & was recommended for substitution? In Category Cii but was eventually transferred to 424 Agricultural Co. at this Depot. “ He was transferred on the 15th May 1917. Another part of the papers state that his disability was Rheumatism and Br. Asthma date of origin of the disability was April 1916. He was said to have developed Rheumatism after coming out of the trenches, so was removed to the base and invalided home on the 3rd June 1916, but there was no swell of joints but complained of pains in hips & legs. He had Bronchitis and Asthma every winter. He was in C???? Camp (writing very faded) from June to September then Knowsley Park & transferred to Heaton Park M/C on the 22nd November 1916. He complained of choking sensation on retiring to bed, shortness of breath, cough, pain in hips and knees. His heart was normal. As can be seen from his records, poor Alfred was to suffer for years, gradually getting weaker, bless him. I found his burial in the St. Mary’s Parish Registers – Burials – Page 147 No. 1174 Alfred ROBERTS, Tanner’s Row, Overton, 1st July 1919, age 36 years. This is his Flintshire WW1 Index Card (Overton F 22) – ROBERTS, Alfred, Tanhouse Row, Overton 274910 10th R.W.F. L/Cpl. Period of Service 3 years 85 days. September 1914 to November 1917. Served in France September 1915 – June 1916. Died from Consumption 27th June 1919. Card signed by S. CHESWORTH, no date.